Who Was Uncle Sam? And Why Did He Want "You"? 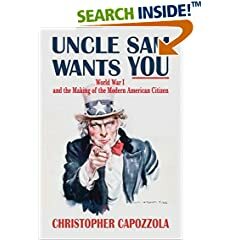 Mr. Capozzola is the author of Uncle Sam Wants You: World War I and the Making of the Modern American Citizen (Oxford University Press, 2008). America itself. One of the nation's most successful illustrators, the thirty-nine year-old Flagg was working on a cover drawing for Leslie's Illustrated Weekly Newspaper. In the upcoming issue of the magazine, editors planned to urge Americans to expand the country's military force, in case world events dragged them into the ongoing tragedy that Americans at that point still referred to as the European War. Flagg was under a tight deadline and short on ideas; he didn't even have a model in his studio to work with. He had his own reflection--tall and lanky, with piercing blue eyes and wavy hair. In all likelihood, he also had a British military recruiting poster designed by Alfred Leete in 1914. That image featured Lord Kitchener, Britain's secretary of war and chief of its military recruitment, pointing at the viewer, with the words "Your Country Needs YOU." Flagg erased the caption, borrowed Kitchener's pose, and substituted his own face for the Brit's--then added wrinkles, whiskers, and gray hair, just for good measure. With that, Uncle Sam appeared, just in time for America's first world war. The picture ran on the cover of the July 16, 1916, issue of Leslie's under the heading "What Are You Doing for Preparedness?" Within a year, despite President Woodrow Wilson's stated intention to keep America out of the war, the nation began mobilizing young men into the ranks. In the spring of 1917, Flagg's image reappeared, this time on a U.S. Army recruiting poster, with its caption restored as "I Want YOU." By the Armistice, the War Department had printed more than four million posters. Ever the patriot, Flagg served during World War I as New York State's official military artist; he volunteered for George Creel's Committee on Public Information, the federal government's official propaganda agency. He even offered a free portrait to anyone who bought a $1,000 Liberty Bond. Flagg composed forty-six posters as part of his wartime service. Of them all, the poster captioned "I Want YOU" has been the most enduring. Why has it become one of the most iconic images in American politics, even a visual metaphor for America itself? Perhaps Americans found that their Uncle Sam, like all good uncles, helped them out: by turning the vast machinery of war mobilization into a family relation, he gave political power a personal face and made sense of the government's presence in everyday life. On closer inspection, though, Flagg's Uncle Sam is a puzzling figure. He is at once watchful and protective, personable and authoritative, individual and institutional. And, like many uncles, he is very badly dressed. His formal attire conveys the solemnity of war's occasion, and his furrowed brow and piercing stare show his seriousness, but his silly hat and ill-fitting suit suggest that Uncle Sam doesn't usually do this. He reassures viewers that war is not in America's lifeblood; the nation, like its uncle, would rather be doing something else. The poster helped Americans understand their relationship to the wartime government. When they sought a visual way to express that state, they chose-four million times--to depict Uncle Sam. What went through their minds in April 1917, when Uncle Sam pointed at them and said, "I Want YOU"? Or that fall, with a military draft in full force, as he told them to buy bonds, conserve food, and keep a vigilant eye on their German neighbors? That winter, as they faced a rising cost of living and shortages of coal and sugar, and as news of American deaths in Europe began reaching their communities, how did they feel when they saw that a poster had been vandalized? Did they share the anger of a group of New York women, who urged Congress to make the defacement of war posters a federal crime? Or were they the ones who had doodled on Uncle Sam in the first place? What did they think on November 11, 1918, when the same poster, faded and battered by the elements, was replaced with another announcing a victory parade? One thing we know is that the word obligation was very much on their minds. During World War I, when Americans discussed their relationship to the state, they used terms such as duty, sacrifice, and obligation. The language was everywhere: in congressional debates about entry into war, on the posters of military recruiters during the conflict, and even in the parades that marked the war's end. Political obligations energized, mobilized, and divided Americans during World War 1. When philosophers talk about political obligation, they generally mean something quite specific: the question of what duties citizens owe to the state and under what terms they will obey its authority. At the beginning of the last century, Americans used the term with far less precision to encompass civic, social, and even psychological obligations. There were explicit political duties, such as jury duty and military service. A 1916 constitutional amendment had brought the new obligation of a federal income tax, although only the nation's wealthiest citizens paid it. Americans also had equally important--if less obviously political--obligations: to work, to be loyal to the nation, to conform to the norms of community. Women were told to obey their husbands, and immigrants' English-language classes taught sentences as straightforward as "I hear the whistle, I must hurry." Looking at the history of a liberal society like the United States, it might seem that Americans have never really had to think much about their political obligations, let alone act on them. In the later wars of the twentieth and twenty-first centuries, liberal individualism, an economy of consumption, a nationalized culture, legally protected civil liberties, and an expanded federal state all played more prominent roles in public life. But even so, throughout American history, a citizenship of obligation has always coexisted with one of rights, as a patchwork of political cultures supported a hybrid state as jumbled as Uncle Sam's ill-fitting suit. From Uncle Sam Wants You: World War I and the Making of the Modern American Citizen by Christopher Capozzola. Copyright 2008 Oxford University Press, Inc. and published by Oxford University Press, Inc. (www.oup.com/us). All rights reserved.